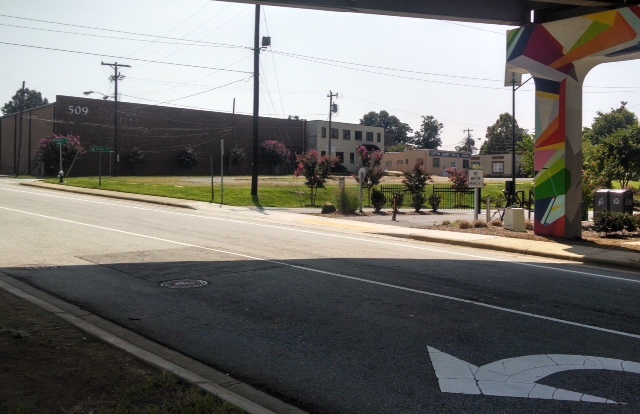 A major redevelopment is planned for a warehouse on Spring Garden Street at the Downtown Greenway’s Morehead Park trailhead. The building, 509 South Edgeworth Street, is at the corner of Spring Garden and Edgeworth, just beyond the Freeman Mill Road overpass from College Hill. It is the former location of Catering by Ellyn, which just up and disappeared one day a few years ago. The $2 million project is scheduled to be completed next spring. A company called “Fresh. Local. Good.” is the developer; it’s a local restaurant, catering, and event company. It owns the Iron Hen Cafe on Cridland Road near West Wendover. Click here for the whole story from the Business Journal. This entry was posted in Businesses, Spring Garden Street. Bookmark the permalink.